Former President Mohamed Nasheed has decided to wait on appealing a 13-year jail term until the Criminal Court provides both a full transcript of court proceedings and sufficient time to prepare, despite a looming appeal deadline of Thursday (March 26). The Criminal Court has so far only provided a judgment summary, and not a full case report as requested by lawyers. The court today blamed the delay in issuing the full report on Nasheed and his lawyers’ alleged refusal to sign statements they had made during court hearings. Another unnamed individual had also failed to sign off their statements, the Criminal Court said, adding that it could not release full proceedings without the required signatures. “We hereby publicly announce that if there is a delay in releasing the detailed case report, it is not because this court has failed in its duty, but because Mohamed Nasheed and his lawyers have not cooperated with the court,” the court said in a statement. But Nasheed’s lawyers said the former president had refused to sign the statements only because they contained serious errors, which they say the Criminal Court has so far refused to correct. “For example, the statement of witness testimony from the Chief of Defence Force contains statements he did not make in court. Further, the Criminal Court omitted President Nasheed’s request for medical attention at the first hearing on February 23,” lawyer Hisaan Hussein told Minivan News. She also noted the statements were not a transcript of all that was said at court, but a summary, which had resulted in omissions and paraphrasing of the actual comments. “The full case report would include the testimonies of prosecutor’s witness which was recounted by the Judge wrongly, submissions made regarding documentary evidence, closing statement submitted by the prosecution, detailed findings of the judges with reference to the evidences and conflicting rulings made on many aspects of procedural law which was contended during the trial. “Additionally, since the first and last three hearings were conducted in the absence of legal representation, the arguments and submissions made by the prosecution regarding witness testimonies, documentary evidence and closing statement will be known only after we receive the full case report,” lawyers said. A High Court appeal could be filed solely based on the judgment summary, but Nasheed’s lawyers said they would then only have the opportunity to argue within the parameters raised in the initial submission. As issues contended in subsequent hearings would only be considered at the discretion of judges, it is imperative that Nasheed receives the case report to prepare his appeal, lawyers said. “The Criminal Court conducted a disgraceful and blatantly politicized trial, and now they are busy trying to hamper the appeal,” he added. The UN High Commissioner for Human Rights Zeid Ra’ad Al Hussein and the UN Special Rapporteur on Independence of Lawyers and Judges Gabriela Knaul last week urged the Maldives to guarantee that Nasheed’s appeal would respect the most stringent fair trial standards and observe due process, including adequate time for preparation. The surprise trial began one day after Nasheed was arrested on February 22, and was completed after 11 hearings in 19 days. “It is hard to see how such hasty proceedings, which are far from the norm in the Maldives, can be compatible with the authorities’ obligations under international law to conduct a fair trial,” Zeid said. The opposition Maldivian Democratic Party (MDP) has decided to launch a national civil disobedience campaign to free imprisoned leader, former President Mohamed Nasheed. A resolution passed at an MDP national council meeting declared the party does not accept the Criminal Court’s 13-year jail term against Nasheed for his role in the January 2012 military detention of Criminal Court Chief Judge Abdulla Mohamed. 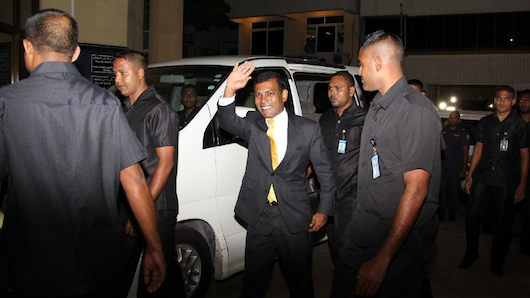 The terrorism conviction effectively bars Nasheed from presidential elections in 2018. “The MDP resolves to free President Mohamed Nasheed from this government’s injustice, to do all necessary to stop the persecution of other politicians, to involve other political parties and other supporters in our work as extensively as possible, to launch a national civil disobedience movement, to reform judiciary and ensure judicial independence, to launch protests and organise petitions, and to accept Nasheed’s last appeal and establish a people’s government,” the resolution said. Speaking at the council meeting, MDP council members called for targeted boycotts against pro-government resorts and businesses and urged mass protests in Malé. Nasheed will remain the party’s president and 2018 presidential candidate, MP for Galholhu North MP Eva Abdulla said. “We, all of us together, we don’t have the sort of courage Mohamed Nasheed does. But we have learnt to take heart from his courage. That is why I say, don’t you dare think we will take a step back,” she said. Pointing to several irregularities in the trial, MDP council members declared they would not accept the guilty verdict, and called on supporters to have courage. “I am eight months pregnant, yet I am determined to continue this fight for justice for President Nasheed and Maldivian citizens. 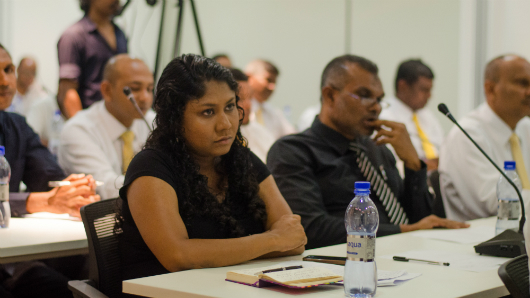 If I have the courage, so does every single MDP member,” said Nasheed’s lawyer Hisaan Hussein. Democracy is won through long hard struggles, many council members noted. “We must remember, history is rife with such atrocities. Authoritarian rulers, in our neighboring India, Mahatma Gandhi, in South Africa, Mandela, sentenced them to long years in jail in an attempt to destroy their political careers. But ultimately, they came out national heroes,” MP and former Speaker Abdulla Shahid said. 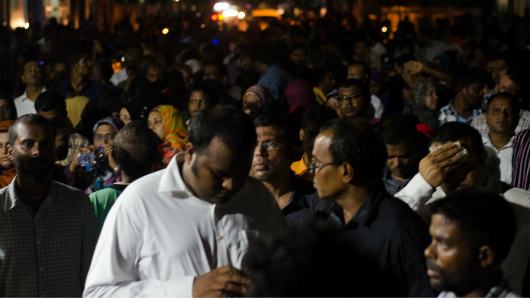 After the meeting, council members led hundreds of supporters in a march through Malé, calling for Nasheed’s release. When the march ended at approximately 12:30am, hundreds of young men continued calling for Nasheed’s freedom on foot and on motorbikes. Six protesters were arrested last night, the Maldives Police Services said. Domestically, the Human Rights Commission of Maldives said the former president was denied fundamental rights that guarantee a fair trial in line with the Maldives’ obligations under the International Covenant on Civil and Political Rights (ICCPR). Moreover, human rights NGO Maldivian Democracy Network urged the UN Special Rapporteur on the Independence of Judges to intervene in order to prevent a “slide back to autocracy,” whilst Transparency Maldives expressed “grave concern” and stressed that Nasheed was denied legal representation, the right to appeal, and sufficient time to mount a defence. President Abdulla Yameen has meanwhile called on all parties to respect the Criminal Court’s verdict against former President Mohamed Nasheed. In a statement released by the President’s Office last night, President Yameen noted that the opposition leader has “a constitutionally guaranteed right of appeal” to challenge his conviction on terrorism charges at the High Court. The High Court today concluded hearings into an appeal by Prosecutor General’s (PG) Office requesting the repealing of a Criminal Court decision to throw out charges of terrorism against 89 individuals from Gaaf Dhaal Thinadhoo Island. Criminal Court Chief Judge Abdulla Mohamed had dismissed the charges, claiming the PG’s Office was refusing to cooperate with the trial after state prosecutors’ failure to turn up to a trial scheduled for 10am on Saturday, November 22. PG Muhthaz Mushin has requested the High Court to rule the Criminal Court’s dismissal of the case through a letter as unlawful and to order the terrorism trials to continue. The 89 defendants faced terrorism charges for allegedly setting fire to the island’s police station, court building, and several police vehicles during nationwide unrest on February 8, 2012 in the wake of former President Mohamed Nasheed’s controversial resignation the previous day. State prosecutor Shaudha Shameem challenged the Criminal Court’s decision claiming state prosecutors had telephoned and informed the court in advance that they would not be able to attend the hearing on Saturday, November 22. She contended the Criminal Court had attempted to handover summons to court outside work hours on November 22, Thursday. But state prosecutors refused to accept summons, as Saturday is not a working day, and because the court had initially scheduled hearings for November 23 instead of November 22, she continued. Shaudha argued that the Criminal Court could only throw out charges in a courtroom in the presence of the plaintiff and defendant, and claimed Judge Abdulla had failed to follow due procedures in dismissing the case. She noted that the Criminal Court had previously consulted state prosecutors in scheduling hearings given their busy work schedule. Two of the 89 facing terrorism charges intervened in the case. with their lawyers – Ibrahim Riffath and Hisaan Hussein – saying the Criminal Court had followed due process by informing the PG’s Office of the November 22 hearing via a letter on the afternoon of November 20. Hisaan said a presiding judge is authorised to dismiss charges if the plaintiff fails to abide by the judge’s orders, and said a judge has the discretion to decide on the validity of reasons provided for failure to attend hearings. State prosecutors must not receive special exemptions, she contended. Meanwhile, Riffath suggested the PG’s Office was lax in cooperating with the trial, pointing out the state had only been able to provide witness testimony during two of the eight hearings. The High Court bench has said it will issue a verdict in the next hearing. A date for the verdict has not yet been set. Muhthaz has since resubmitted the cases to the Criminal Court twice. The court rejected the cases on Monday claiming it had no guarantee of cooperation from the PG office. The PG office submitted cases again yesterday with a letter pledging full cooperation. Defence lawyers have previously criticised Judge Abdulla’s earlier decisions during the hearings. Last week, the chief judge ordered 55 of the 89 defendants be held in detention pending the outcome of the trials, claiming the accused were intimidating witnesses. All have subsequently been released. Defence lawyers have described the judge’s decision to hold the accused in custody as “most unusual” as the identities of state witnesses were not disclosed and had their voices disguised in order to protect their identity. Around 80 people from Addu City are also currently facing terrorism charges in relation to unrest in the southernmost atoll on February 8. Former President Mohamed Nasheed’s legal team on Sunday stated they had not been officially informed by the civil court of the rescheduling of the defamation case filed by Commissioner of Police Abdulla Riyaz against Nasheed. A member of Nasheed’s legal team, Hisaan Hussain, said they had seen local news reports that the hearing had been postponed on Riyaz’s request, but had not been officially informed. Hussain said they had no information as to when the hearing had been rescheduled to. “The procedure is that the person who filed the case has to request for postponement at least one hour before the hearing. We don’t know when Riyaz sent in the request, we saw it in the news around 11:15pm,” Hassan said. In addition to this, the legal team noted that they had so far not received details of the case and were not aware which action or words of Nasheed had prompted Riyaz to file the defamation case against him. “We haven’t had any official word as to why the case has been filed. Again, through local media we have heard it was because Nasheed had called Riyaz a ‘baaghee’ (traitor). What we have heard through official means is only that it is a case for defamation, and that Riyaz wants compensation for a loss that this alleged defamation has caused him,” Hassan said. Another member of the legal team, former Minister of Youth and Sports Hassan Latheef, pointed out that while Riyaz had filed the defamation case in the civil court, the police were continuously arresting people for calling them ‘baaghee’ (traitor) on the streets, and that the criminal court was continuing to provide extensions of detention periods for people arrested under the charges. “The articles in the penal code against defamation has been removed. Defamation is now considered a civil offence, and yet police continue to arrest people for expressing their opinions on the police force under what can only be perceived as charges of defamation,” Latheef said. A second case regarding similar defamation allegations against Defence Minister Mohamed Nazim is also pending. In response to a question posed by Minivan News, Latheef said that Nasheed would respect the decisions reached by the National Executive Council (NEC) of the Maldivian Democratic Party (MDP), referring to the NEC’s decision to not abide by court orders until the changes proposed by international community are brought to the Maldivian judicial system. “Since President Nasheed is MDP’s presidential candidate, he accepts that a decision by the NEC is one that he, too, would wish to abide by in principle. The NEC, after much consideration, came to that decision. Hence President Nasheed believes that he will act in accordance with it,” Latheef said. The legal team stated that Nasheed would decide whether or not to attend the hearing once he is officially notified of the rescheduling by the civil court. MDP International Spokesperson Hamid Abdul Ghafoor told Minivan News today that the MDP would go ahead with the scheduled trip to the atolls, although the Hulhumale’ Magistrate Court has placed Nasheed under island arrest with regard to a case against him for the arrest of Criminal Court Chief Judge Abdulla Mohamed. “We will be leaving tomorrow for the southern campaign. We will not budge,” he said. Minivan News tried contacting Commissioner of Police Abdulla Riyaz, but he was not responding to calls. Maldives Police Services Media Official Sub Inspector Hassan Haneef was also not responding to calls. The Maldivian Democratic Party’s (MDP) protests in Malé escalated into violence over the weekend, with police and protesters sustaining injuries, arrests of demonstrators, intimidation of reporters, attacks on police, torching of police vehicles and vandalism of several businesses. The MDP has vowed to continue street protests from July 8 until President Dr Mohamed Waheed’s administration is brought to an end. The party alleges President Mohamed Nasheed was deposed in a coup d’état on February 7 and has called for early elections. Police arrested more than 65 protesters over the weekend, including the MDP Youth Wing President Aminath Shauna on Friday evening, and President Nasheed’s former legal advisor Hisaan Hussein on Saturday evening. Shauna was released by the Supreme Court on Saturday at 9:00pm, after Chief Criminal Court Judge Abdulla Mohamed ruled that she not take part in protests for 21 days. On Thursday night Minivan News observed dozens of policemen with riot gear and batons charging at protesters gathered at the junction of Chaandhanee and Fareedhee streets at approximately 1:00am. Protesters had heckled police and refused repeated police orders to disperse from the area. Some had also thrown empty water bottles at police. A Minivan News reporter was among the crowd that ran before the police into the Sultan Park near the protest area. Pavement stones were flying in the park, but it was not clear who was throwing them. The crowd then gathered at the Chaandhanee and Majeedhee Magu junction afterwards. Minivan News saw a truck full of policemen driving through the streets at high speed, and individual policemen threatening and taunting protesters. In a statement on Friday, police said MDP’s protests on Thursday night had turned into “riots” with protesters attacking law enforcement officers with chilli-infused water and pavement stones. A police officer was diagnosed with retrograde amnesia after being hit on the head, police claim. Those arrested also included two disabled women, the MDP said. “Demonstrators were always within demonstrating area set by regulation when police violently dispersed the crowd,” the MDP claimed. Police also attacked and beat President Nasheed’s former Human Rights Ambassador Mohamed “Go-go” Latheef and Malé Mayor “Maizan” Ali Manik, the party claimed. The protest continues at the Chaandhanee Magu and Fareedhee Magu junction at the time of press. According to police, officers repeatedly asked the protesters to disperse from the area after midnight, but protesters threw glass pebbles and heavy lead balls at the police. The police were then forced to show “zero tolerance” to control the “atrocity” against them, the statement read. Protesters attacked police media personnel, beat and threw a 45-year old man into the sea, broke the window panes of two shops, snatched seven mobile-radio sets and attacked several police officers, the police claimed. In the attacks on the police, several police vehicles were damaged and one was set on fire, police added. “The mob went on savaging the Male’ City streets, attacked another police officer and damaged his police motor bike near Masjid-Al-Zikra, a mosque in Majeedhee magu close to the junction. The mob also throwing pave stones to a police vehicle broke its window panes near the Le’cute’ shop, and a few yards east to the central junction on Majeedhee Magu scorched another motor bike,” the statement read. Commissioner of Police Abdulla Riyaz on Twitter on Friday said he had instructed the Operation Commander to take necessary action to minimise injuries to police officers. Police Spokesperson Hassan Haneef explained Riyaz’s statement to local media Sun Online as meaning an instruction to take action to disperse protests at the first sign of violence. Meanwhile, the Police Integrity Commission (PIC) on Thursday evening conducted breathalyzer tests on police on duty after protesters alleged police on duty were intoxicated. The test results were negative. The MDP has condemned police attacks on its MPs, journalists and protesters. MDP members have posted photos on social media depicting bruises and bloody cuts allegedly caused by the police. Police have denied any political motive behind Shauna’s arrest and said she was charged with obstruction of police duty. Shauna’s arrest has meanwhile sparked international media attention with an online petition and a Twitter campaign calling for her release. A professor at Westminster College in the US state of Missouri has asked President Barack Obama to seek Shauna’s release. Shauna graduated from Westminster College in 2008. “I fear for her safety and her life. I call on President Obama to demand her immediate release from prison and to grant her political asylum in the United States. She is the victim of political repression,” Professor of Political Science John Langton told newspapers the Fulton Sun and the Kansas City Star. Criminal Court Judge Abdulla Mohamed released Shauna at 9:00 pm on Saturday evening on the condition that she does not take part in protests for 21 days. Reporters of private television station Raajje TV, which broadcasts live coverage of MDP protests, told Minivan News they had to stop coverage after receiving death threats at around 4:00am on Friday. Cameraman Ibrahim Riyaz said police had been verbally abusive towards him and journalist Zaidhullah Shabeen all night. “When protesters set fire to the motorbike, a police officer came looking for us. Then we heard other police officers in riot gear say, ‘let’s beat them, destroy them and the station,’” he said. Raajje TV reports its cameraman Mohamed Shanoon fell unconscious after being baton-charged and suffered a collarbone injury on Wednesday night. The Committee to Protect Journalists (CPJ) has expressed concern over attacks on journalists from police and protesters. Private television station DhiTV’s presenter Mohamed Ameeth was mobbed by protesters on Wednesday evening. However, protesters told Minivan News police in trucks had driven at them at high speeds causing protesters to scatter. “We were afraid they would run us over,” protester Ahmed Yasmin said.